Honor 8A (JAT-AL00/TL00) Entry-Level Smartphone Certified by TENAA; Full Specifications Revealed - Playfuldroid! A new Honor phone with model numbers JAT-AL00 and JAT-TL00 has been certified by China’s TENAA telecom authority. The specifications of the smartphone that have appeared through its TENAA appearance suggests that it could be an entry-level device from the company. The Honor JAT-AL00/TL00 measures 156.28 x 73.5 x 8mm and it weighs 150 grams. Its color variants are black, blue, gold and red. The smartphone is fitted with a 6.088-inch display that produces HD+ resolution of 720 x 1560 pixels. The handset is packed with a 2,920mAh battery. The smartphone is powered by 2.2 GHz octa-core processor and 3 GB of RAM. It could be the first low-budget smartphone from the company to arrive with Android 9 Pie OS preinstalled. The back panel of the phone will be housing a 13-megapixel camera. For selfies, it is equipped with a frontal shooter of 8-megapixel. The smartphone will be available in 32 GB and 64 GB storage choices. A microSD card slot is available on the device for expanding its storage. The handset lacks support for fingerprint scanner. The images of the Honor JAT-AL00/TL00 entry-level smartphone have not appeared on TENAA yet. The TENAA listings of the phone are expected to get updated with the images in the next few days. 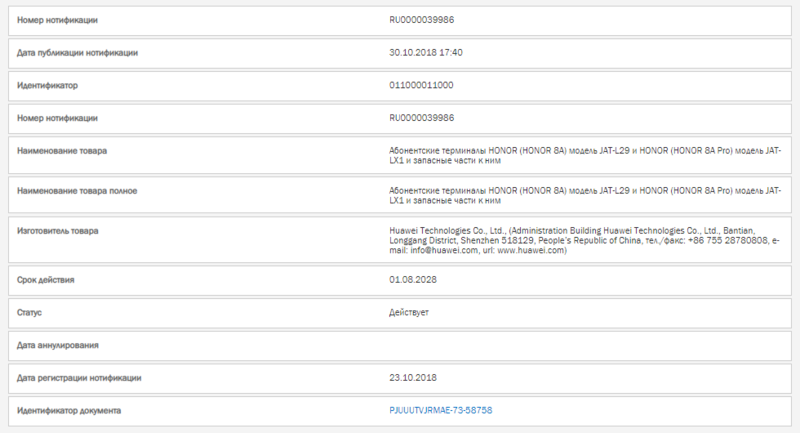 The appearance of the Honor JAT-L29 at EEC has revealed that it will be hitting the European markets as Honor 8A. Hence, the JAT-AL00/TL00 models is the same phone. The Chinese manufacturer will be also releasing Honor 8A Pro in Europe. It has a model number of JAT-LX1. Probably, it could be the 64 GB edition of the smartphone.